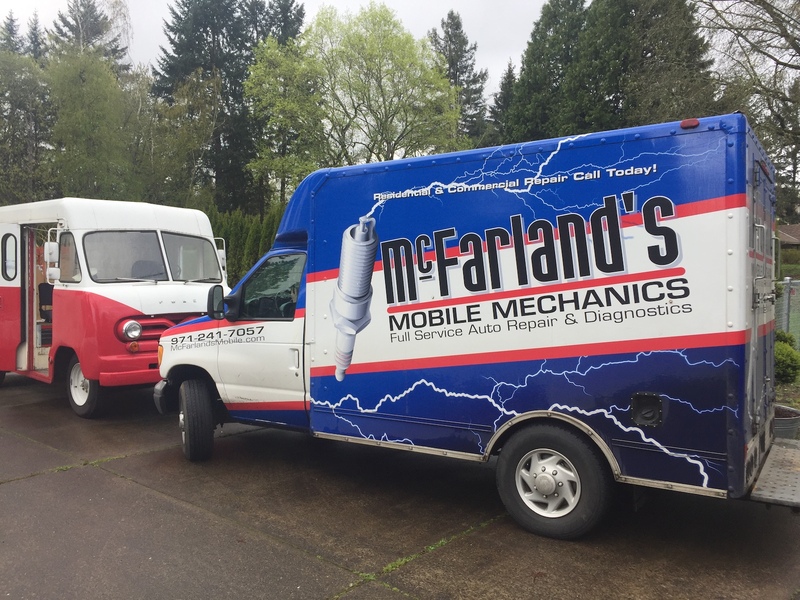 Today I had Brett from McFarland’s Mobile Mechanics come out and diagnose my engine. And sure enough, it was a rod knocking. So that means it’s time to rebuild the engine. The house call cost me $85 but it was very informative. 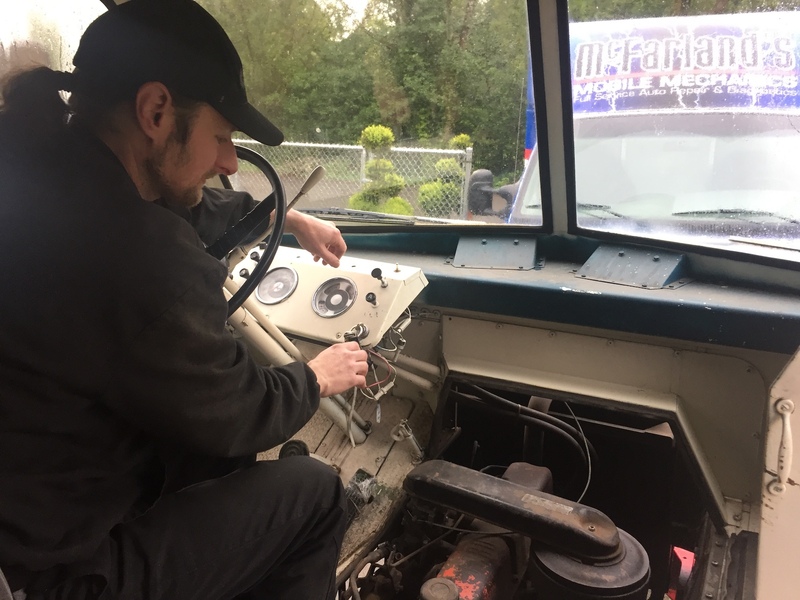 The good news is, Brett can pull the engine on-site with their cherry picker and deliver it in long-block form to Portland Engine Rebuilders next week. It will come out the side door, after taking off a few steel panels around the engine compartment. That’s okay, because I need to strip and repaint the cockpit anyway, one panel at a time. Brett recommended keeping the Ford 223 Six engine (versus upgrading to a bigger one) because it’s original, notoriously reliable, and easy to work on. Plus, it mates to a known-good transmission and there’s no compelling reason to swap that out to handle a bigger engine. He said my cruising speed would still top out at 55 mph anyway. He actually owned a 223 in his F-100 so he’s got first-hand experience. He did suggest adding an electronic ignition kit for around $100, which sounds like a no-brainer. No sense in worrying about adjusting points if I don’t have to. So I made the arrangements for next Wednesday. It will take four or five hours to remove at $107 per hour, and then Brett will deliver the engine to PER where Ron will take it and completely rebuild everything inside the core for a flat $2,122. That process will take three or four weeks, but they have the state-of-the-art machinery necessary and they’re experts in these old engines. Meanwhile, the van will still be in my driveway where I can continue working on the inside. And that’s an ideal scenario if I want to be driving it by summer. Brett’s eyes got huge when he first saw the rig. He couldn’t believe I found one in such good shape. Most of them are completely rusted out or scrapped for parts. He said he thought it was easily worth $10K in its current state. So that made my day, and eased the blow of these inevitable engine-repair expenses. I had budgeted $4K total for that work and so far, so good. Previous PostInsulation PlanNext PostBubble Dome Skylight? Love this! Can I sign up to get your posts delivered to my inbox? Yes! Followed you over from ford-trucks.com and am in some way relieved to see this is the direction being pursued for a variety of reasons, but primarily because it will make it back onto the road. Seems like you got some sound advice. And because I don’t want to leave another comment elsewhere, the bread decals are rad.